The Taoiseach made the comment as he launched the government’s new online safety strategy, which will see Facebook and Google on an advisory panel. Taoiseach Leo Varadkar said tech companies need to invest in more staff so they can take down reported content more quickly. 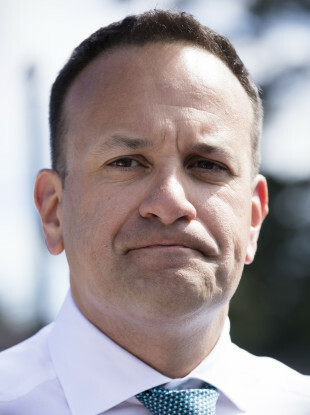 TAOISEACH LEO VARADKAR has said he is appalled to hear how Facebook ruled that a post saying “knacker children should be burned” was not against the website’s community standards. Varadkar was asked about the matter at the government’s national strategy for online safety in Dublin today. He told reporters he had not seen the post mentioned, but said he could not imagine how such language could possibly be tolerable. “I am appalled to hear that, quite frankly,” he said, adding that if something of that nature was said about women, black or LGBT people, it would not be allowed. The Taoiseach said he would follow-up on the matter with Facebook as he could not understand how the social media site’s standards would not rule a post like that out-of-order. In response to his remarks, a Facebook spokesperson told TheJournal.ie there was a mistake in its processes which meant the post was not removed. This post violates our Community Standards on hate speech and should have been removed. We’re sorry that this did not happen, and we’re looking into why it was not removed. Hate speech is never acceptable on Facebook and we work hard to keep it off our platform. We have invested significantly to expand our safety and security teams to help deal with problematic content and introduced new technology to proactively detect hate speech without anyone needing to report it. In fact, of the 2.5 million pieces of hate speech we removed from Facebook since January this year, 38% was flagged by our technology. The Action Plan for Online Safety includes the establishment of a national advisory council on online safety and a national communications campaign. Junior Minister of Communications Sean Kyne said it is envisaged that Google and Facebook will be asked to sit on the advisory council, as will other stakeholders from children and youth groups. The report states that while online platforms are engaged in online safety measures, such as working with the gardaí, tech companies may have to do more. A whole of government approach is needed to tackle online safety says the Taoiseach. When asked by TheJournal.ie what companies such as Facebook and Twitter, should be doing, the Taoiseach said the big tech companies are “very attuned” to the issue. “They know that failing to act when it comes online safety is damaging their reputation and potentially damaging their shareholder value in the longer term – that is what big companies care most about, let’s be honest. He said some smaller tech companies don’t have the resources or staff to carry out that kind of work at all. Varadkar said companies also need to ensure they respond to user complaints quickly, or ensure it cannot be uploaded in the first place. While the action plan notes a voluntary code of conduct for tech companies, the government has been criticised for not regulating the tech industry, many of whom have their European headquarters in Dublin. “The internet, by its very nature, has a global reach that governments don’t have,” said the Taoiseach. Despite committing to establishing a Digital Safety Commissioner earlier this year, the government appears to be rolling back on the promise. The Law Reform Commission recommended that such an office be set up in 2016. A Sinn Féin’s Private Members Bill, introduced in 2017, to set up such an office was passed. However, the government said the Bill raised “jurisdictional and other legal issues”. Other aspects of the Bill include the publishing of an annual safer internet report, creating a new gov.ie website where all online safety resources can be accessed, as well as equipping teachers and parents on online trends and digital safety. Email “Taoiseach 'appalled' that comment referring to 'knacker children' not removed by Facebook”. Feedback on “Taoiseach 'appalled' that comment referring to 'knacker children' not removed by Facebook”.